LG is launching this new smartphone in a few months, and it is called LG signature. LG signature Edition 2018 price has been set as Rs. 1,23,000. It is set to go for pre-orders and will be sold from August 13 in India. 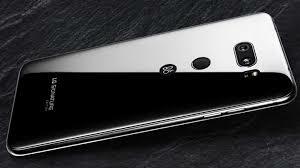 The phone sports metal edges, and a Zirconium Ceramic back that prevents scratches, and improves durability. It has its fingerprint scanner located at the back. The camera sports two lenses stacked horizontally, with the flash sitting beside it. The 3.5mm audio jack is seen sitting on the top edge, while the volume rockers are seen on the left edge of the device. It runs on Android 8.0 Oreo with LG UX, and it sports a 6-inch QHD+ (2880×1440 pixels) OLED display with an 18:9 aspect ratio, HDR10, 538ppi pixel density, and Corning Gorilla Glass protection. LG signature smartphone is powered by the Qualcomm Snapdragon 845 octa-core processor paired with Adreno 630 GPU, and 6GB RAM. The smartphone offers 256GB of internal storage that can be expanded further with the help of a microSD card slot (up to 2TB). The camera includes two 16-megapixel cameras. The rear unit supports LED flash. At the front, there is an 8-megapixel camera. The LG_Signature Edition (2018) packs a 3300mAh battery with Qualcomm Quick Charge 3.0 fast charging and wireless charging support as well. Connectivity options include 4g VoLTE, 3.5mm audio jack, Bluetooth 5 LE, GPS, NFC, USB Type-C, and Wi-Fi 802.11 ac. The smartphone dimensions measure at 151.7×75.4×7.3mm, and it weighs 157 grams. It is IP68 certified for water and dust resistance and supports Hi-Fi Quad DAC and DTS: X 3D Surround Sound.